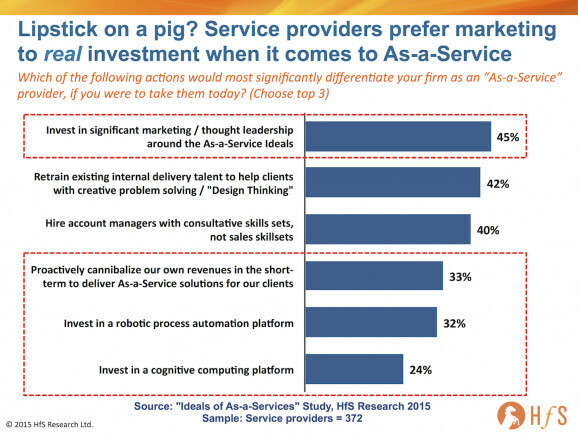 The data from our brand new "2015 As-a-Service Study", where we canvassed the views and dynamics of 716 service buyers, providers and advisors, is fresh off the analytics tools, and we're starting to unravel just how messed up our industry is, as we try and forge a path away from legacy outsourcing practices. Yes, folks, most provider executives (45%) want the nice glossy magazine ads, website banners, white papers, airport billboards, webcasts etc., more than anything else. Barely a quarter (24%) want to invest in a cognitive computing platform, a third in robotic process automation, with a similar number wanting to see their firms proactively cannibalizing their own legacy revenues to develop As-a-Service solutions for their clients. However, providers do view upgrading their talent as a higher priority than investing in new technology, with 42% prioritzing the retraining of existing delivery teams with Design Thinking skills, and 40% bringing in consultative talent from outside to replace the long-outdated cheesy sales approach. 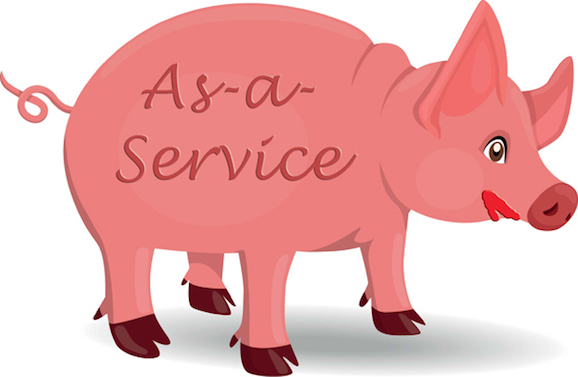 The services purists among us can appreciate that providers need to upscale their talent in order to take advantage of evolving technology solutions, analytics and automation offerings. In all honesty, I find this data both depressing and alarming. Most of our beloved providers want to talk a big game more than having the real chops to prove it. It's just like it was ten years ago when most providers were selling cheap offshore deals under the guise of helping clients with genuine "transformation". Now, it's simply many providers selling a more mature offshore delivery scenario with much more sparkly and jingly bells and whistles to impress their clients. My concern, today, is we've become so obsessed with thought-leadership and big ideas that we're losing touch with reality. What's more, it's almost impossible to tell apart most of the service providers - they all have a digital story, an outcomes strategy and at least one guy wielding some form of RPA game plan. We can't continue in this vein for much longer - we're all getting increasingly bored hearing the same old guff. What we need is hearing from the clients who are actually investing with their providers. We need to hear about the incremental steps and investments providers are making with their clients to start that long transition from legacy world to that far-off As-a-Service nirvana. We need more reality and less fantasy. Very informative survey Phil. I think providers who are turning a blind eye towards leveraging technology as an enabler are going to miss the bandwagon. In fact there is a great pull for optimising not just the transactional/rule-bases but also commoditising the strategic. All this would not be poosible without technology platforms and integrated offerings. It's amazing how this (and related topics) have now crept up to the top of the agenda and in the industry social debate over the past year and more. Just a couple of years ago (late 2013), I recollect meeting some industry senior folks and being surprised at the general lack of enthusiasm towards products/platforms and consulting. 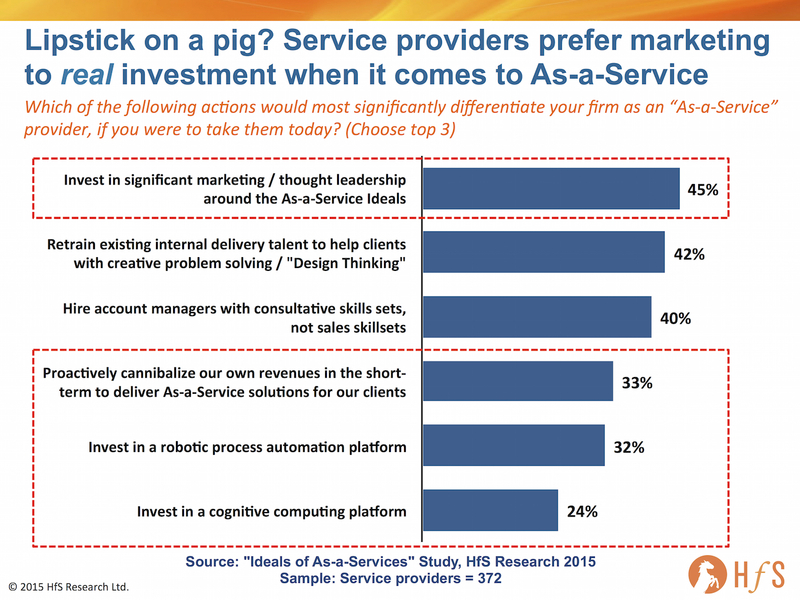 Seems like it's still at the interest/desire stage than real actionable investments, having said that maybe it is worthwhile to broaden the space and see the picture - to see how large services firms are attempting to add new capability, beyond RPA platforms. If you look at the moves some providers have been making in recent years (Accenture, IBM, HP and more recently CTS and Infosys) they are obviously acquiring capability through acquisitions of products (SaaS/others) and niche solution firms, that will help them design offerings closer to ready to use services solutions for their clients. In many cases, the acquisitions have focused on the new areas (say acquiring a growing SFDC services firm or an analytics product provider for CPG firms). I agree where the rubber hits the road is when you actually shift clients over from traditional systems and do it proactively in collaboration and do real transformation. You are right, they need to do both. And we know the answer why that is so painful to do (we have debated this often), history is filled with examples why incumbents find it difficult to change despite the noise they make. As you mentioned - all are saying the same story across analytics, digital etc. who are actively doing it? and so why it eventually is all about the disruptors first, we should focus there too. Who are the emerging firms that are positioning as-a-service pure breed offering - in the specific categories/segments? And who are the enterprise buyers making the change? Where will the early run happen? It all depends on what you mean by marketing (and I ended up becoming a CMO after running products and strategy)...if marketing is just embellishment, I agree. That's what many service providers end up doing, and it shows. However, that's not what marketing is supposed to be - specifically in industries that do marketing well. That's where marketing and thought leadership are a means to describe the art of the possible so that it helps decision making within the client's layered organization - do you really want to leave that to the SMEs? That wouldn't scale. Let's also not forget that marketing and thought leadership are intended to elicit feedback, and that's invaluable to product teams in early stages of the cycle - you don't want to leave the onus of collecting that feedback to the sales force alone...especially when you innovate. So net - you need marketing and thought leadership to do innovation. It is not lipstick on the pig. But yes, the temptation is indeed strong to take shortcuts and put too much makeup on. The problem is that this services industry, the vast majority of it atleast, is usually not known to be the benchmark for b2b marketing or innovating new products/services in a regular manner working close to the customer. Given the disruptive context, it should definitely be that service providers demonstrate and lead on the creation of the new delivery model; starting with the investments and helping the early adopters hop on.